This week we answer a question and build an episode around an email from one of our listeners, David. David wants to know the difference between getting more of a traditional sound (think NOLA style or the 1920’s) and a more modern, bebop oriented sound. 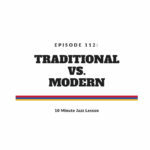 This was a really fun topic and we explore it using a timeless jazz standard. I have written two short segments of what I consider to be completely different styles. I think you’ll gain something from this episode no matter what type of sound you’re going for. Enjoy! Also and maybe more interesting for me, the harmonic and stylistic developments after bebop. I’m not always sure how these are defined, but one hears about particular movements such as ‘hard bop,’ ‘cool’, ‘impressionism’, etc., as well as the idea of ‘post bop’ or ‘straight-ahead in general. – the ‘lydian chromatic concept’?